Sony has discovered that its product, Hard Disk Photo Storage ("HDPSM1") may have possibility of the data stored on it to be damaged during the data transfer process. 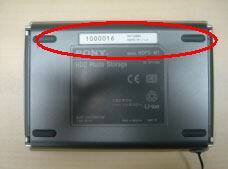 In Australia, only "HDPSM1" with the following serial numbers may be affected: 1000158-1000257. The symptom may occur when the customer is using the "HDPSM1" singly (i.e. not connected to a computer) and transferring data from the memory card to the hard disk drive (HDD). During this data transfer process, if the customer cancels the data transfer by pressing the "cancellation" button twice, it may result in the data stored on the HDD being damaged. Sony sincerely apologises for any inconvenience that this issue may cause and we thank you for your understanding and co-operation. The model name and the serial number are indicated on the seal on the backside of the product. (circled in red in the picture below).